The Renaissance Las Vegas, 14-story non-gaming hotel, 3400 Paradise Road, sits opposite the Las Vegas Convention Center. The Renaissance Las Vegas 14-story non-gaming hotel sits just a short walk away from the world-famous Las Vegas Strip, while also being opposite the Las Vegas Convention Center and the Convention Center Monorail Station, making it the perfect spot for both pleasure seekers and people visiting Vegas for business. Combining a good location with good amenities and comfortable rooms. The hotel offers a good range of amenities, including a vast twenty-thousand square feet events space, which is ideal for weddings or business functions. Along with an excellent fitness center, where you can maintain your usual regime while on holiday and a trendy games room, which includes things like pool and table tennis among many others. 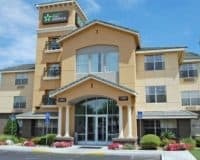 The hotel also hosts a number of cafes and restaurants, including a Starbucks that allows you to start your day in the right way and a steakhouse, which serves award-winning food. It also provides all the usual things like free parking and easily accessible WIFI, ensuring that you make the most of your stay. The rooms have a retro-design, with huge 55-inch televisions, equipped with cable coming as standard, along with coffee making facilities, comfortable beds, and bathrooms decked out in marble. 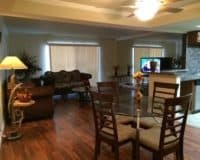 This ensures that you will have a comfortable stay, during your time in Las Vegas, be it for pleasure or business. 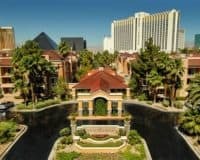 The Renaissance Las Vegas Hotel is an ideal choice for both pleasure seekers and people in Vegas on business, combining comfortable rooms, with a great location and decent amenities. 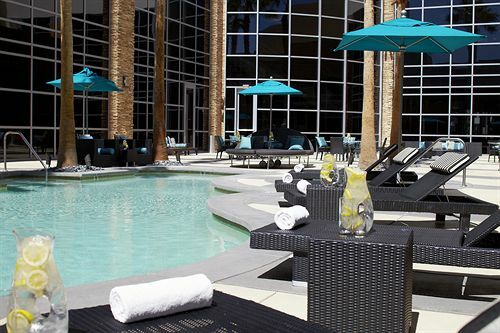 It is not the most extravagant hotel that you will find in Vegas, however, it is certainly one of the better locations on the next price rung down.